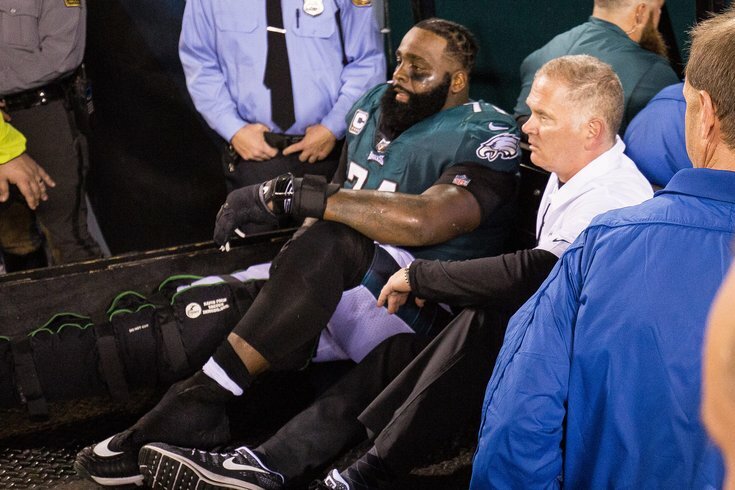 Jason Peters is one of many Eagles still recovering from surgery this offseason. Last Saturday, PhillyVoice reported that Philadelphia Eagles defensive end Derek Barnett had surgery to repair a sports hernia injury. On Wednesday, Tim McManus of ESPN reported that Brandon Graham had surgery for an ankle injury suffered late in the Eagles' regular season. Barnett and Graham join a long list of Eagles who are recovering from surgery this offseason, to the point where it's probably time to put them all in print, just for the sake of having them all in one place. • QB Carson Wentz: Wentz continues his rehab from a torn ACL and LCL suffered Week 14 last year in Los Angeles against the Rams. Wentz says he is on track to start Week 1 of the 2018 season. The team has been less willing to set any goals for his return. • WR Alshon Jeffery: Jeffery played all season with a torn rotator cuff, and had surgery to repair it after the season. He will miss all spring practices, but could be ready to go for the preseason. • OT Jason Peters: Peters tore an ACL and MCL Week 7 last season against the Redskins. He should be ready to go for Week 1 of the 2018 season. • DE Brandon Graham: As noted above, it was revealed by Tim McManus of ESPN that Graham had surgery for an ankle injury suffered late in the Eagles' regular season. McManus reports that "while there is some hope he could participate in organized team activities or minicamp, the more concrete goal is to be ready for training camp in July." • DE Derek Barnett: Barnett had sports hernia surgery shortly after the Birds' season concluded. According to the source, the recovery period is only six weeks, and the procedure should make that area of his body stronger. Do the math, and Barnett should already be recovered. • DT Timmy Jernigan: Jernigan reportedly had surgery for a herniated disk in his back late in April. The recovery period is four-to-six months, which means that the likelihood is high that he will miss some time at the beginning of the season. • LB Jordan Hicks: Hicks ruptured his Achilles Week 7 against the Redskins last season. He said in April that his recovery from surgery is ahead of schedule. • LB Mychal Kendricks: Kendricks had surgery on his ankle, per McManus, which was "described as a clean-up that should only sideline him for a few weeks." • ST Chris Maragos: Maragos suffered a season-ending knee injury Week 6 against the Panthers last season. The progress of his recovery is presently unknown (by me, anyway).